Released in 1956 by the E.S. Lowe company, the ‘shake and score’ dice game of luck and probability has a quirky story of origin. Historical accounts give credit for the game’s invention to an anonymous (and wealthy) Canadian couple who created it as a form of entertainment while at sea on their yacht. Loosely based on other historical dice games, the ‘Yacht Game’ became a hit with their friends, leading the couple to contact New York-based toymaker Edwin Lowe to produce copies of the game that they could give as gifts. Lowe’s company had previously introduced the game of Bingo to U.S. public. Seeing potential in the Yacht Game, he offered to buy the rights to it from the couple. They readily agreed with the sole stipulation that he give 1,000 units to them. The name of the couple has never been revealed and, despite the success of the game, no one has ever come forward to take credit for its invention. Lowe changed the name of the Yacht Game to Yahtzee and began marketing it. Initial advertising campaigns resulted in lackluster sales, leading the entrepreneurial Lowe to try something different. To capture the inherent fun in playing the game, he began organizing Yahtzee parties where people could learn and play the game. His grassroots efforts eventually paid off, and through word-of-mouth, demand for the game begin to skyrocket through the 1960s and early 1970s. 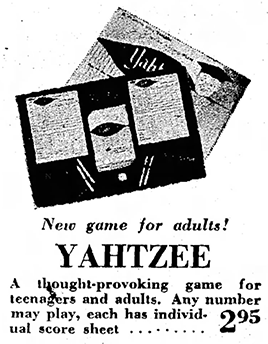 The object of Yahtzee is to score as many points as possible. Players score points by rolling five dice, up to three times per turn, and making various combinations. The game’s scorecard consists of 13 categories spread across upper and lower sections. The upper section contains six boxes, labeled 1-6, while the lower section contains five poker-influenced options (three of a kind, four of a kind, full house, small straight, and large straight), a Chance box, and a five of a kind (or Yahtzee) box. Deciding which category to fill in each turn is the core of the game strategy. Each category has individual scoring rules. Bonus points are also possible, depending on the roll of the dice. Once every player has taken 13 turns, the one with the highest score wins the game. The E.S. 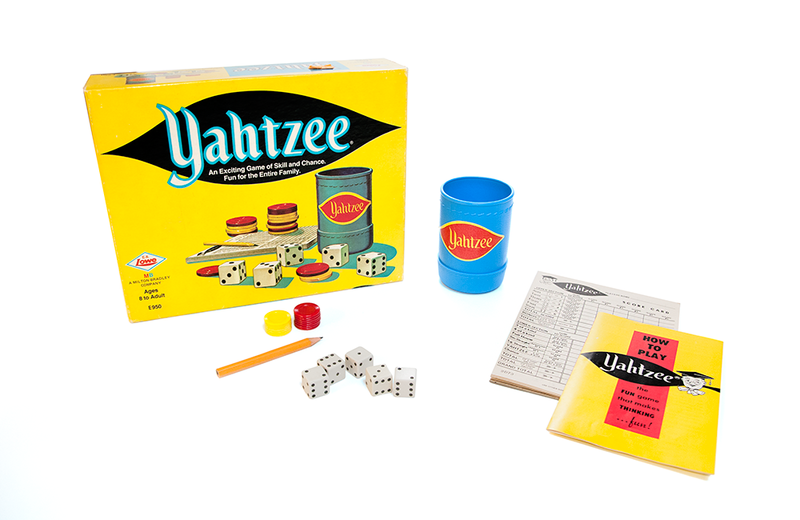 Lowe Company was acquired by Milton Bradley in 1973 and the rights to Yahtzee went along with it. Milton Bradley became a subsidiary of Hasbro in 1984. Despite these changes, Yahtzee remains an evergreen product for the company, with total sales eclipsing 50 million worldwide. This sales success has spawned a slew of variants of the game, including Word Yahtzee, Challenge Yahtzee, Triple Yahtzee, Yahtzee Texas Hold’em, and Casino Yahtzee. Electronic and online versions of the game have also come to market. Hasbro has thrown its own licensed brands into the Yahtzee mix, releasing versions including Hello Kitty, Pokémon, Super Mario, Pac-Man, and even one celebrating the 40th anniversary of the movie Jaws. Frame-tray puzzles are aimed at young puzzlers and were often advertised as helping children develop coordination and motor control. Toy Tales regularly uncovers fantastic items that are perfect for gift-giving and 2017 was a stellar year for creations that captured our attention. To help our readers bypass the mediocre finds to discover the gifts that will make a lasting impression this holiday season, here are the ingenious, creative, memorable, and fun items we've unearthed this year.